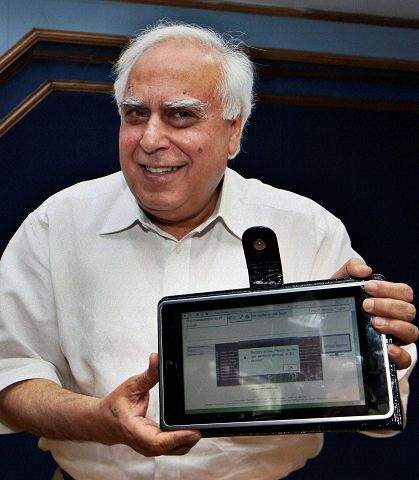 Kapil Sibal, Indias Human Resource Development Minister, displays a $35 computer in New Delhi, India. MUMBAI, India  It looks like an iPad, only its 1/14th the cost: India has unveiled the prototype of a $35 basic touchscreen tablet aimed at students, which it hopes to bring into production by 2011. If the government can find a manufacturer, the Linux operating system-based computer would be the latest in a string of worlds cheapest innovations to hit the market out of India, which is home to the $2,127 compact Nano car, the $16 water purifier and the $2,000 open-heart surgery. The tablet can be used for functions like word processing, web browsing and video-conferencing. It has a solar power option too  important for Indias energy-starved hinterlands  though that add-on costs extra. This is our answer to MITs $100 computer, human resource development minister Kapil Sibal told the Economic Times when he unveiled the device Thursday. In 2005, Nicholas Negroponte  co-founder of the Massachusetts Institute of Technologys Media Lab  unveiled a prototype of a $100 laptop for children in the developing world. India rejected that as too expensive and embarked on a multiyear effort to develop a cheaper option of its own. Negropontes laptop ended up costing about $200, but in May his nonprofit association, One Laptop Per Child, said it plans to launch a basic tablet computer for $99. Sibal turned to students and professors at Indias elite technical universities to develop the $35 tablet after receiving a lukewarm response from private sector players. He hopes to get the cost down to $10 eventually. Mamta Varma, a ministry spokeswoman, said falling hardware costs and intelligent design make the price tag plausible. The tablet doesnt have a hard disk, but instead uses a memory card. The tablet design cuts hardware costs, and the use of open-source software also adds to savings, she said. Profitability is also a question for the $35 machine. Epps said government subsidies or dual marketing  where higher-priced sales in the developed world are used to subside low-cost sales in markets like India  could convince a manufacturer to come on board. This and similar efforts  like the Kakai Kno and the Entourage Edge tablets  show that there is global demand for an affordable device to trim high textbook costs, she said. If it works, Epps predicts the device could send a shiver of cost-consciousness through the industry. It puts pressure on all device manufacturers to keep costs down and innovate, she said. The project is part of an ambitious education technology initiative by the Indian government, which also aims to bring broadband connectivity to Indias 25,000 colleges and 504 universities and make study materials available online.